Reception 6 p.m. � Dinner and Program 7 p.m. The Witte Museum, 3801 Broadway St.
It�s time to get your resolutions turned in to the BCMS Delegation to TMA. Ifyou have any issues you would like the BCMS Delegation to TMA to consider regarding changes in policy or a stance you would like them to take on a particular issue, click the link below for a sample form you can use to get started now with your draft. The BCMS Delegation to TMA will meet in early February to review any resolutions submitted for consideration. The deadline to submit your draft resolutions to BCMS is Tuesday, Jan. 31, 2017. To submit your draft resolutions or if you need assistance with drafting your resolution ideas, please contact Mary Nava, BCMS chief government affairs officer and delegation liaison at mary.nava@bcms.org. Are you from a family of doctors going back generations? What made you go into medicine and how are things different for you compared to your parents or children who went into medicine? San Antonio Medicine magazine will have an issue later this year featuring stories from local doctors whose parents/grandparents paved the way and/or children who followed their path. Mike Thomas at 210-582-6399 or mailto:mike.thomas@bcms.org. The Junior Volunteer Council is looking for new members! The JVC is open to all teenagers (8th-12th graders) whose parents are members of BCMS and/or BCMS Alliance. The JVC offers opportunities for volunteerism, leadership and social events. The first meeting is Sunday, Jan. 29, at 3 p.m. at Big�z Burger Joint, 2303 N. Loop 1604, San Antonio 78258. For more information contact Liz Huang at edwilson4six44@gmail.com or (205) 522-3009. This information is sent on behalf of our sponsors but it is not an endorsement. 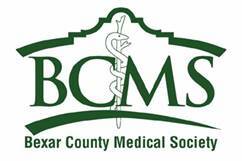 Copyright � 2015 Bexar County Medical Society, San Antonio, Texas.